Obama Defends Health Bill Against Attacks From Left In an interview with NPR, the president said that those from the left of his party who criticize the bill are ignoring the "real human reality that this will help millions of people." 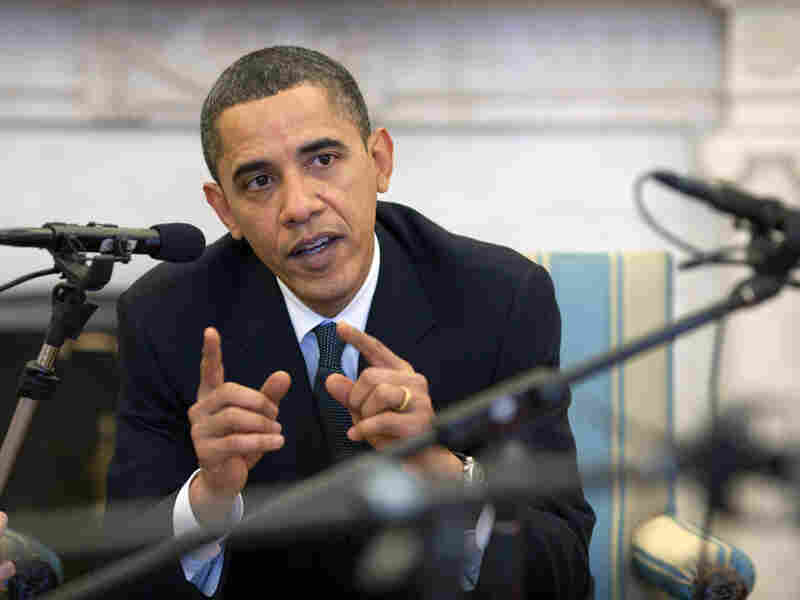 President Obama defended the health care overhaul during an NPR interview Wednesday. President Obama hit back at critics within his own party over the landmark health care overhaul packages moving through Congress during an interview with NPR's All Things Considered. "This notion I know among some on the left that somehow this bill is not everything that it should be ... I think just ignores the real human reality that this will help millions of people and end up being the most significant piece of domestic legislation at least since Medicare and maybe since Social Security," Obama told NPR's Robert Siegel and Julie Rovner. The interview was held at the White House on Wednesday, after Obama delayed his Christmas vacation in Hawaii until after the final Senate vote on the health care reform bill, scheduled for 7 a.m. Thursday. The bill is expected to pass, as Senate Democrats have already overcome a concerted Republican filibuster effort by assembling the bare minimum of 60 votes. The next step will be to reconcile the House and Senate versions, which could be a very difficult, drawn-out process. With the bill set to clear the Senate, the president is beginning to insert himself into negotiations after largely trying to avoid being pinned down on the details of the health care proposals. Obama told NPR that he supports a key provision in the Senate bill that would raise revenues to pay for the expansive plan by taxing insurers that provide so-called Cadillac plans, or high-end employer-paid insurance plans. "I'm on record as saying that taxing Cadillac plans that don't make people healthier but just take more money out of their pockets because they are paying more for insurance than they need to do, that's actually a good idea," he says. "That helps to reduce the cost of health care over the long term." "I'd say we did really well"
"A lot of provisions in here that protect against insurance company abuses"
"The most significant piece of domestic legislation at least since Medicare"
"Changing how we think about medicine"
The House version relies instead on taxing individuals making more than $500,000 and couples earning over $1 million. But Obama added that the final financing method will likely be a blend of the House and Senate plans. "I think what we're going to end up seeing is a little bit of both," he says. "You're going to have some provisions that are smart that are in the House bill. There are going to be some provisions that are the right thing to do in the Senate bill." More broadly, Obama defends the months-long process by which Democrats in the House and Senate wrangled over provisions and brokered a series of last-minute compromises. "I have to say that if you had told me at the beginning of this year that at the end of a grueling process in which the opposition I think has been more politically driven and ideologically driven than substantive, that I'd still have a bill potentially for me to sign that provides 30 million people coverage ... I'd say we did really well," Obama says. For Obama, the political stakes over the fate of this health care bill are extremely high. Facing sagging ratings in the polls, along with a unified and re-energized Republican opposition, Obama is counting on the health care bill to help bolster Democratic fortunes as the 2010 midterm congressional elections approach. A number of the most significant provisions in the health care bill won't take effect for several years, but Obama insisted that Americans will start to notice some changes early. "Right away, there are a whole host of insurance abuses that will be put to an end after this bill is signed so that through fine print, insurance companies can't suddenly drop you when you get sick," he said. But the upcoming conference session between House and Senate negotiators will be a tough slog. While the House and Senate bills are largely similar, there are some thorny differences that will have to be reconciled, including how the plan is financed and how the divisive question of restrictions over federal funding for abortions is handled. "Ninety-five percent of the House bill and the Senate bill are in accord," says Obama. "There are going to be some tough negotiations around the 5 percent."